Height: 6' 1" Weight:208 lbs. Background: Talk about a great roster move! 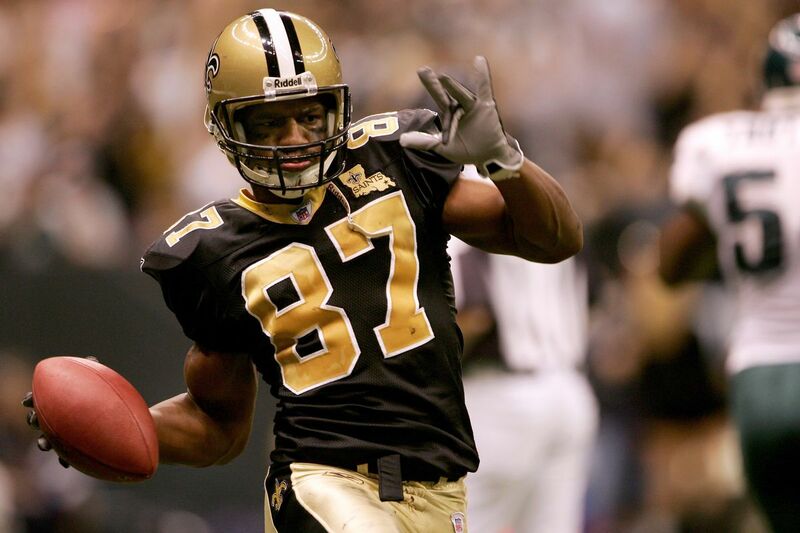 The New Orleans Saints and Randy Mueller, along with Jim Haslett, signed a little known wide receiver named Joe Horn prior to the 2000 season. In four nondescript seasons with the Kansas City Chiefs, Horn had a modest 53 catches for 879 yards and seven touchdowns while starting just two games. In New Orleans, he became a star. Who could have seen it coming? Perhaps Mueller and Haslett. Horn became an instant star in 2000, whether it was Jeff Blake or Aaron Brooks throwing him the ball. He started all 16 games, exploding for 94 catches for 1,340 yards and eight touchdowns, earning Pro Bowl honors as he was primary reason for the Saints winning the NFC West over the defending Super Bowl champion St. Louis Rams. The Saints went on to beat the Rams for their first-ever playoff win. Horn continued his outstanding play in 2001 with 83 catches for 1,265 yards and nine touchdowns, earning another Pro Bowl berth. In 2002, he was equally as good with 88 receptions for 1,312 yards and seven scores and went to the Pro Bowl again. In 2003, he had 78 catches for 973 yards and 10 scores and in 2004, he enjoyed his last huge season with career highs of 94 catches, 1,399 yards and 11 touchdowns to earn another Pro Bowl honor. Horn was plagued by injuries in his final two years in New Orleans, missing nine of 32 games. 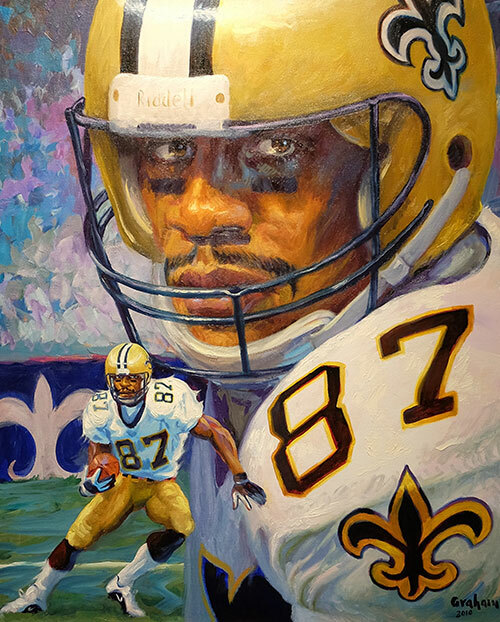 Still, he finished his illustrious career with the Saints third in franchise history in three categories with 523 receptions for 7,622 yards and 50 touchdowns. He led the team in receptions and receiving yards for five consecutive seasons (2000-04). He holds the top three individual seasons in receiving yards in team history. Horn is the all-time leader in franchise history with 28 games of 100 or more receiving yards. There have been four elite receivers in New Orleans Saints history in Marques Colston, Eric Martin, Danny Abramowicz and Horn, who backed up his dynamic, boisterous personality with his play. Greatest Moment: It would have to be the one that most remember the most, the Sunday Night nationally televised game against the New York Giants in the Louisiana Superdome on Dec. 14 of that year. Aaron Brooks had one of his best games as a Saint, completing 26-of-35 passes for 296 yards and five touchdowns with no interceptions. Horn caught nine passes for 133 yards and a career-best four touchdowns. With 5:51 to play in the second quarter and the Saints holding to a 10-7 lead, Brooks fired a strike to Horn on a skinny post route for a 13-yard touchdown. With assistance from Michael Lewis, Horn went and looked underneath the goal post padding and pulled out a cell phone. It was a flip phone, by the way. The prank drew a 15-yard penalty for unsportsmanlike conduct and Horn incurred a $30,000 fine. Honors: Horn was inducted into the Saints Hall of Fame in 2010. He was named to the Pro Bowl in 2000, 2001, 2002 and 2004.